The LF-853D 5 in One Multi-Function S.M.D. Rework Station. 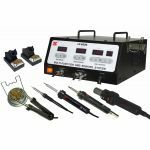 This unit is the best tool for repairing work, combination with Xytronic LF-852D and LF-8800 which is specially designed for lead free soldering/ desoldering, surface mount devices with temperature controlled hot air. Choose a Xytronic LF-853DTP Rework Station Today.